It’s easy and cheap to send an email; and just as fast to send it to a dozen people. While this makes the medium a powerful social and business tool, sometimes checking your email is just…annoying. While ordinary spam contributes a lot to this, sometimes repeatedly receiving email from unwanted people becomes a bother. 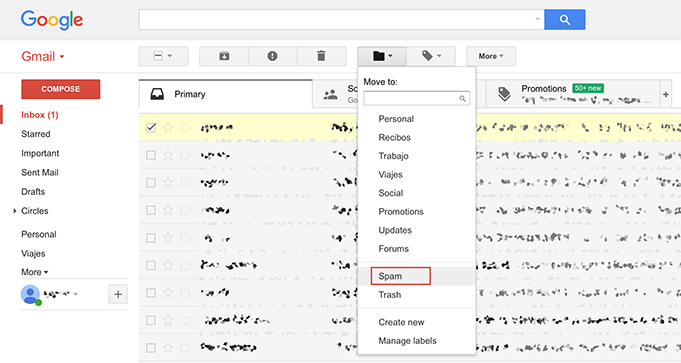 Fortunately, if you constantly receive time-wasting or harassing emails from a particular sender, it is easy to configure Gmail to simply discard any future messages from that address. Gmail is equipped with an excellent spam filter, but no rules-based filter can completely eliminate this annoyance. If you’ve already hit “Unsubscribe” but the ads keep on coming, blocking mail sent from that address will solve the problem. Simply log into your Gmail account normally, and open any email from the unwanted person. If your inbox is sufficiently crammed that you have trouble locating one, just enter his name into the search box at the top and press Enter. Once you are viewing the email, you’ll see the sender’s screen name near the top left, followed by his email address and options for actions such as video calls. There will be an arrow pointing down next to the sender address; clicking this will open a whole menu of options. One of these will be labeled “Block ‘XYZ’” (XYZ being the sender’s name). Clicking on this will bring up a dialog box asking you to confirm the action. Once you do this, any future emails from that account will land in your spam folder rather than your inbox. If you wish to receive emails from that address again at some point in the future, you’ll need to click on the gear-shaped icon near the top left corner of the window. This allows you to view and change your Gmail settings by selecting “Settings”. This will bring up a number of different tabs; you will want to select “Filters and Blocklist”. You only have to scroll down until you find the person’s name and click “Unblock” to the right of that line. Gmail makes some effort to keep its system safe and convenient for their users. If the email seems suspicious – for example, claiming to be from your bank but asking for information they should already have, for “identification purposes” – you should still click the arrow pointing downward next to the sender’s address, but select “Report Phishing” instead. This allows Gmail staff to investigate that sender’s activity and potentially prevent other users from falling victim to a scam. If, on the other hand, the message is simply annoying and obviously intended to promote some business – that you haven’t explicitly given permission to send you marketing material – you can select “Report Spam”. While not involving actual criminal activity, this helps Gmail filter out spurious emails from all their users’ inboxes. If you are not trying to avoid annoying, pointless or even harassing emails from one particular address, taking these actions instead helps to make the internet a little better place for everyone.